Note: I have updated and added files to some of the older pages above. I have finally reached a point in my research where most of the Astro section diagrams have been found to concern a specific time and place: 07 December 1486, near the center of Aries (astrologically 07Taurus). The diagram of f68r3 is the centerpiece. I have added a new page above with a flowchart showing my interpretaions and how they are related, then a sky map with the collected diagrams. I do not know, yet, what is so significant about this spot, and research is continuing. Since the events of the Astro section happened in the Pisces/Aries/Taurus part of the sky, I wondered, if f67v1 is Tycho’s 1572 supernova, why it would be there since it happened in Cassiopeia. After much searching online, I discovered the reason is its astrological position was 07 Taurus. I think I have identified all of the stars on the folio, and discovered that all of the named stars are astrologically also in Taurus! Having an astrological position, I checked to see if it is represented in the Zodiac section, and I think it is. The folio order is Taurus Light, Taurus Dark, then Gemini, so the first 15 degrees of the sign would be on Taurus Light. On other folios, the small square “start here” point is generally on the 10:00 position. The nymph at the top of the inner circle has a can with a unique design, so I think it is first. The pattern is easy to see, and the nymph at the 7° position is holding a unique star, representing the supernova. This may also indicate how to “read” the Zodiac folios. 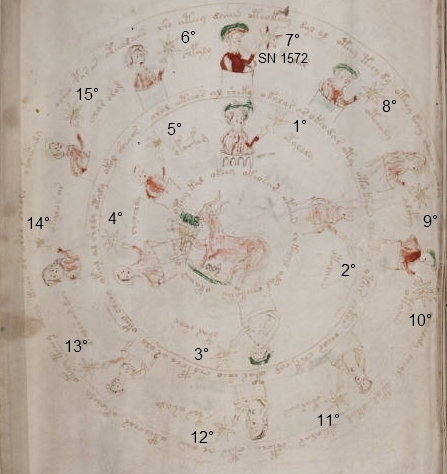 A few years ago I was invited to join the Journal of Voynich Studies, an online journal and library (link in the sidebar) with important research available. I felt honored to be taken seriously enough to get the invite. My work was also mentioned in Kennedy and Churchill’s book The Voynich Manuscript. I even made the index! : ) However, what is there is outdated now. The dating of the vellum a few years ago to 1404-1438 provides a lower limit to the creation of the book, but does not preclude a later date. It is my contention that the Astro section depicts real astronomical events, as well as astrological interpretations of them. I have recently had the idea that the Zodiac section might be a detailed analysis of the events depicted. For example, If each nymph represents 1° of the sign, then the stars with tethers might represent a comet and where they appear together is the comet’s path through the sign. I haven’t yet started investigating this idea.